Are We There Yet?? : Home Again, Home Again, Jiggety-Jig! Norwich looked about the same as always when Amanda and I finally arrived back home last night around 6:00 - perhaps there was a little more color in the trees but it was hard to tell as clouds covered the sky and and it was getting dark even earlier than usual. Still, Norwich is home and after driving a little over 1,060 miles since Saturday, I was happy to be here! I've got lots of pictures to post and stories to tell since Saturday but for today it's no rest for the wicked and back to work for me for a double-shift. Tomorrow I'm working a day shift to cover for the guy who covered one of my shifts while I was away so it may be awhile before I get the time to get caught up. Ah well, at least I've got 'blogging material' for awhile! In the meantime, I'll leave you with a picture that Amanda took from the passenger seat on Tuesday night as we drove up to Scranton to meet with Mark & Lisa - as you can see, it was a beautiful drive in spite of those dark clouds overhead! What a great shot Amanda took too. So that's what fall looks like in your part of the country. Awesome. I don't need to tell you autumn here isn't all that spectacular. You really have to search for those kind of colors. Don't work too hard. I'll await your trip postings. 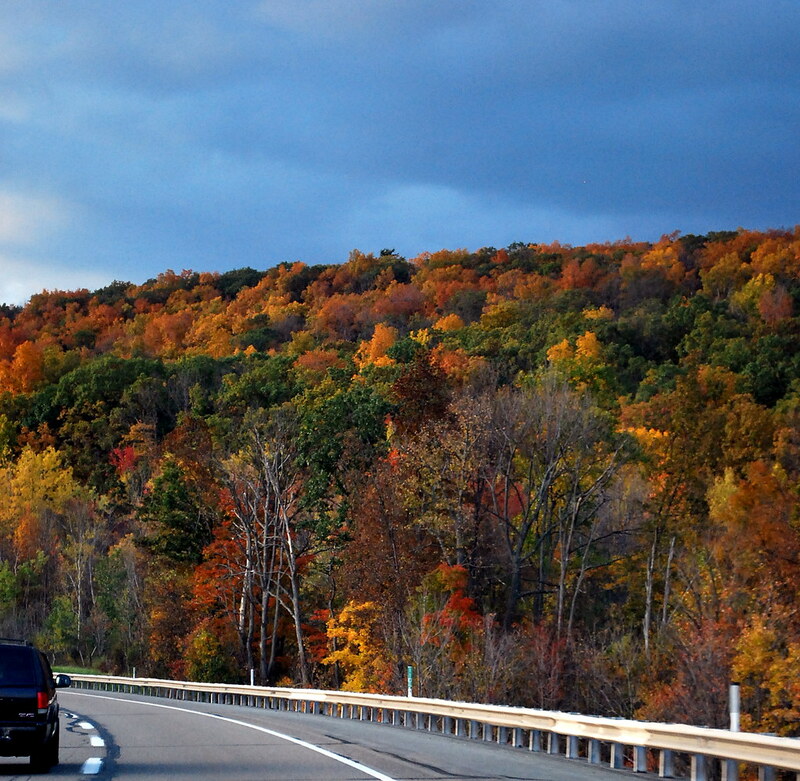 That is a photo guaranteed to bring in the Leaf Peepers. I love passenger photography! Amanda did great! I can not begin to express how much I miss Autumn in New England. I know that one day I will move back, for my sisters and Autumn. Maybe God will work it out that I can winter in the Georgia mountains... you never know! OH my just look at those colours! there is a little church in Blairsville Ga that always put "Fall, God's Paint Brush" on their sign. looks like you got to see peak colors! good for you! Great colors in that photo! That is breathtaking! Truly breathtaking. One of these years we would love to see your part of the world in the fall. p.s. I still have tears on my face from reading what you left on Sarge's blog. You got to me. I have never in my life seen a picture with so much vivid Color. I truly am amazed with this shot. I have never seen fall color like this on the west coast. I am certain someone will say they have. But for me not. Thanks for sharing!!!! !